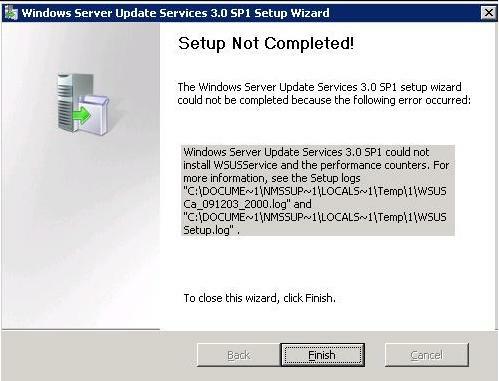 Posted on January 8, 2010 by Uma Yellapragada Tagged MicrosoftMicrosoft WindowsService packSysPrepWindows Server Update ServicesWindows UpdateWindows XPWSUS	CommentsNo Comments on Client not reporting to WSUS Console. Client not reporting to WSUS Console. The first thing to check is whether the client computer is using the latest Automatic Update client version. On the left navigation, from Windows Server Update Services -> Windows Update Agent API -> Using the Windows Update Agent API -> Updating the Windows Update Agent.  Imaged clients with a duplicate client ID will only appear once in the WSUS Admin Console. Each AU client must have a unique id which is created for each individual install. When imaging systems it is recommended always to use SysPrep. The WSUS admin console will only display one client for each unique ID. If you have multiple clients created from one image which are sharing the same ID, only one will appear in the WSUS admin console. All clients will check in and download updates, but only one will appear and display status in the WSUS admin console. In cases where clients are not checking in, and they were created from images without running SysPrep, the following steps will reset the existing duplicative client IDs.
. Below steps helps in resolving the issue.